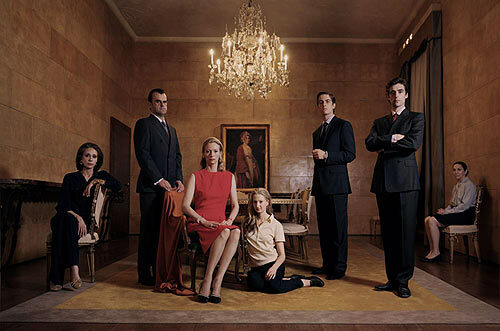 The opening scene of Guadagnino’s I Am Love (2009) throws the doors wide open onto the lavish lifestyle of an upper class Italian family, the Recchi’s, great industrialists who have accrued a vast fortune through their textile empire. As the city of Milan is entrapped in a wintry chill, the Recchi’s enjoy the warmth and comfort of a traditional Italian family dinner, yet one with a formal agenda. At the centre of the family lies the matriarchal Emma (played effortlessly by British actress Tilda Swinton) who appears to be the perfect, demure Italian wife and mother, despite her Russian origins. The family business is formally passed down to her husband, Tancredi (Pippo Delbono) and eldest son Edo (Flavio Parenti). Emma is then introduced to Antonio (Edoardo Gabbriellini), an artisan chef and newfound friend of her son, Edo. It is Emma and Antonio’s mutual passion and respect for food that sparks her sexual awakening and results in their illicit affair. This results in the family unit slowly fading into insignificance and the importance of the individual takes centre stage. On the surface, I Am Love revolves around family loyalty, consumerism, and ultimately Emma’s sexual and emotional liberation from bourgeois tradition. However, by reducing the focus upon narrative story-telling, Guadagnino gives us so much more than the typical convoluted melodrama by taking us on a journey of the senses. Visually, the film is an aesthetic joy as we are transported from the fast-paced bustle of the richly decorated Recchi mansion to the peaceful tranquillity and postcard-landscape of the Italian countryside. The performances are (as far as melodrama goes) both downplayed and elegant, making more than enough room for John Adam’s excitable score. As Emma arrives in Sanremo she spots Chef Antonio and after deliberation decides to act upon her impulse and peruse her desire. At several key points during Emma and Antonio’s passionate infatuation, the orchestral score of Lollapalooza gives a sense of fast-paced momentum and anticipation. The score almost always complements, and at times contends with the on-screen action, and is vaguely reminiscent of Hitchcock’s manipulation of music with narrative. I Am Love is, in almost every sense, a stunning picture that shuns the world of materialism in favour of a subtle exploration of human-kind’s innate, carnal desires. The climatic love-making scene is beautifully clichéd; as Emma is disrobed of her clothing, stripped of her sophisticated pretence and lead into Antonio’s arms, you cannot help but think of Pascale Ferran’s intense Lady Chatterley (2006). Guadagnino’s vision clearly suggests that it is the little things in life that provide us with the most pleasure. For Emma it was one innocent bite that gave her a new taste of life; one of love, passion and a new individual existence of freedom.